Tradition and passion have played an essential part in the Boulin's family history for over 100 years. Since 1880, the estate at Saint-André-du-Bois, formely part of the Château Malromé, home of Toulouse Lautrec, has been in the hands of five successive generations. 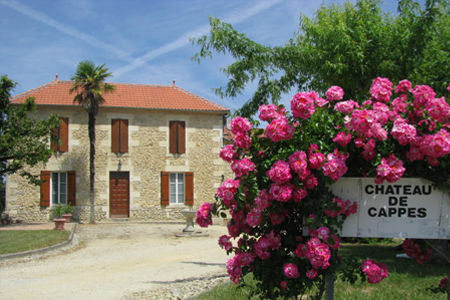 The Propery is situated on the right bank of the Garonne, at about 50 kilometres south east of Bordeaux and 10 kilometres from Langon, close to the medieval village of Saint-Macaire, in the area of the Appellation d'Origine Contrôlée : Côtes-de-Bordeaux-Saint-Macaire. The first two generations to cultivate wines on this estate also combined mixed farming with the rearing of cattle and poultry farming. Yves and Marie-Jeanne BOULIN later devoted themselves exclusively to wine making. In 1983 Patrick BOULIN took over, soon to be joined by his sister Nicole. On May 2nd 1989 the name Château de Cappes was registred by the family. Cédric, after a BEPA and BAC PRO vine and wine at the scholl of wine making and oenology 'La Tour Blanche' in the Sauternais, a technical/commercial BTS in wine and spirits at the school of Libourne-Montagne and a wine making course in the King Valley in Australia was the next menber of the family to join the business. Patrick, Nicole and Cédric will be delighted to welcome you to their estate and share their passion with you.